I finally had the time to do the install of my Brembo 17Z brake kit this weekend. I had to swap to S4 uprights to get these to fit. While in there, I installed SPC adjustable upper control arms, and put in some new strut mounts. The biggest complication I ran into was having to grind my uprights down slightly to get these "Stage 2" rotors to fit. Luckily, not much was needed to clear (the structural integrity isn't an issue as it was just a few mm in an area with plenty to give. It seems this particular rotor option had only been fit to a C5 A6. But, everything is installed now. I got the car aligned on Monday, so I haven't really been pushing the limits of the brakes so I can allow them to properly break in. So far, so good! 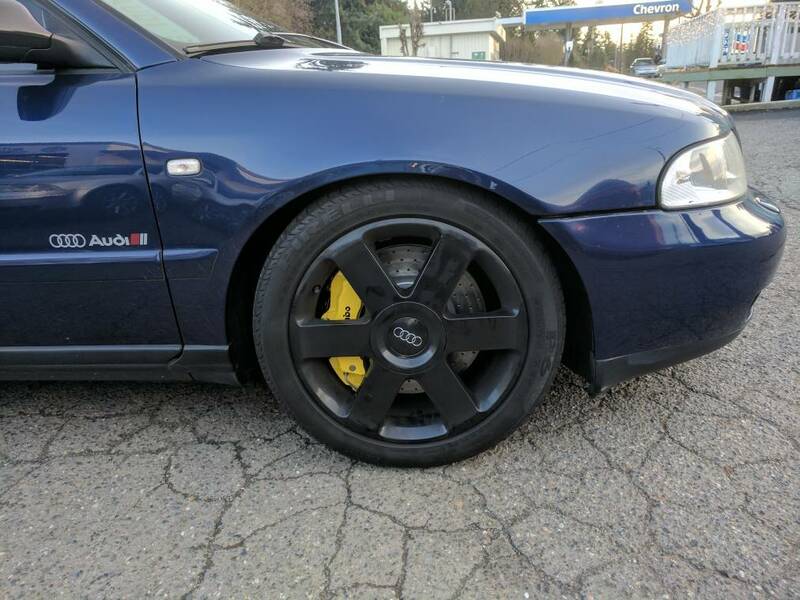 You used C5 A6 front rotors? What specific car? Apikol also makes a set of brackets to fit these, to the tune of $230 or thereabouts. 2004 S4- 2.7t, Shaved bay, PTE5858 single turbo. No they aren't C5 rotors. The guy we use for these kits modifies rotors from a Volvo or Benz I believe. The specific rotor I got had been tested on a C5 and not on a B5. He also drills them as shown in the picture. This is cool swap hay, I have test bolted up my z18'§ yesterday I swapped over my uprights to the b6 and have ml55 rotors funny thing is I had the grinder there ready to go and was looking thought I was smoking to mutch looked again and it seems I dont have to grind anything hmmmm but lucky I think was the easiest thing I have done so far lol. Very nice! I wanted to go with an 18Z kit myself, but my winter wheels are 17" and theyre powdercoated black so I've already invested $$$ into them, and I like them a lot as a winter wheel. On a seperate note, I drove the car again today and it feels great. I upgraded to Stoptech RS4 lines which has helped my pedal feel. They should, we used the same lines on my buddies 18Z setup on his B5 S4. We use the StopTech RS4 Brake Lines. I don't know the part number off the top of my head. Sorry about that. You where able to swap to s4 uprights without having to swap axles? Yeah the axles bolt right up. I believe you need to have an 01 for this, but that could be wrong. is your car a 1.8 or v6? all 01s have the larger front outer cvs whether 1.8 or 2.8. I used my 01a axles with the small cv end and used vw van cv joints. had the center lathes down to take the c clip. Seems to work I couldn't find any axles tryed for a while still looking lol but the cv joints were 55bux for 2x. Rather than the 100+ for 1 here. interesting fact about the 01's I never knew. B5 1.8tqm Avant, B6 1.8tqm Avant. Easiest way to run 17/18z on an a4 is run s4 uprights 01 a4 axles or s4 axles. 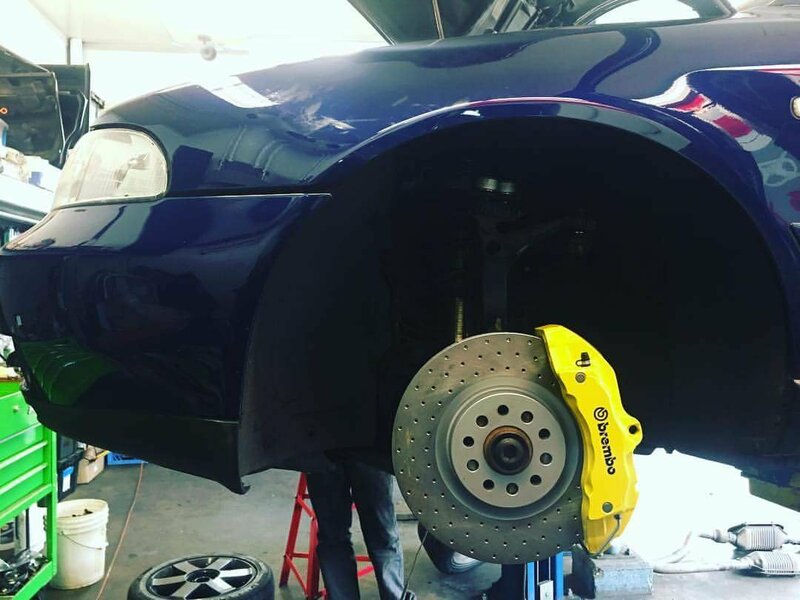 stoptech makes the lines for them and run mercedes c230sport rotors, after boring the lug holes out to acomodate the audi lugs. IIRC you need to mill off some material off the mating surface of the caliper to have it sit correctly over the rotor. "Better stick to your A4 forum, peasant." It depends on what size rotors you run, the guy we get our stuff from has a set of rotors that dont require the caliper to be machined at all. I went with a thicker rotor which required grinding on the upright, and for the caliper to be machined slightly. With the Mercedes c230 sport rotor "330mm" I believe you need the machining done. These look so nice tucked away, well done sir! The only thing keeping me from doing it is the cost of the adapters, should just try to make my own.